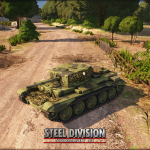 Two weeks now that the fierce fighting in Steel Division: Normandy 44 began! If you want to join the battle, grab the game on Steam! The reviews from the press are positives: Rock Paper Shotgun, IGN, Strategy Gamer… The Dynamic Frontline is a great feature that renews the RTS genre, the 3-Phases system allows players to create many different tactics, details and accuracy are praised along side with the IrisZoom. Your opinions are also very important to us, so we’d like to thank you all for your feedbacks and your reports. The game already reached 80% positive reviews on Steam, but we still work hard to improve your experience! Since the launch of the game, we heard your complaints: we released a patch that improved the Chinese language and a first fix that solved the multiplayer disconnection issue, and we decided to translate the game into Spanish as well. Of course, we are working hard to make the game better, more stable and find solutions for the last main problems. A big balance patch is also coming. Like always, updates will follow soon, and we’ll keep you in touch! Today, we’ll focus on the anti-tank mechanic, as we did for the anti-air. When you choose your AT units, you may feel overwhelmed, not sure which squads you want to pick for the battle. Indeed, towed or self-propelled, they all have their own purpose and characteristics. 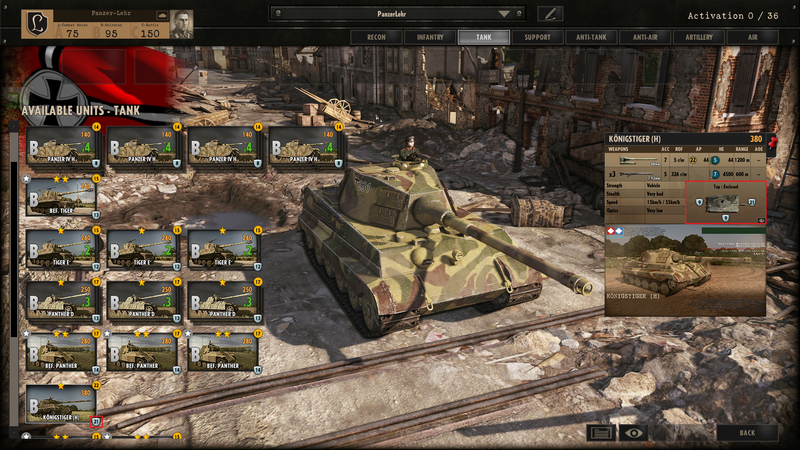 The Armor value that indicates tanks and vehicles’ resistance against enemy fire. The armor value is represented in the unit’s card by a diagram with different numbers for front armor, sides armor, and rear armor. Usually, tanks are more vulnerable on their sides and rear. The Armor Piercing (AP) value that indicates the weapon’s armor piercing value at maximum range. The higher, the better: you’ll inflict more suppression damages, have a greater chance to penetrate, and maybe you’ll even pierce the armor with your first shot. 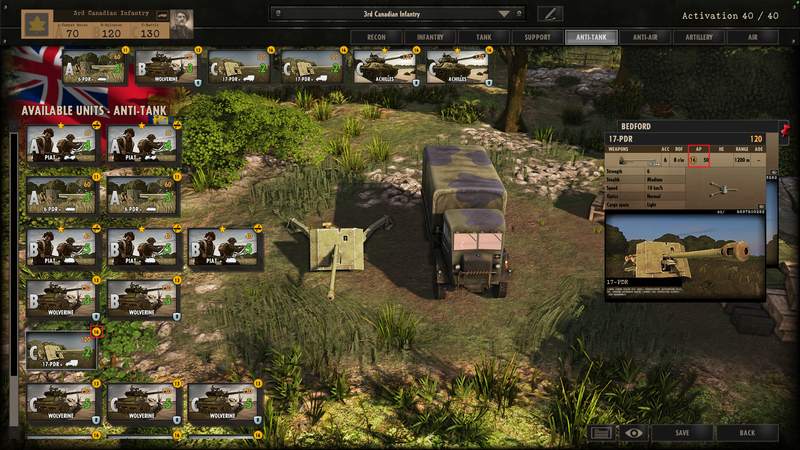 The AP is displayed by the number in a yellow circle in your battlegroup and in each unit’s card. The breaching symbol indicates a powerful infantry weapon, only useful at close range but usually with deadly effect. AT guns: with long-range kinetic weapons, these units have the advantage to gain +1AP when they bring their guns 100 meters closer to their target. So, they become stronger and more deadly as they advance. AT units with rockets and shaped-charge weapons indicated by the HEAT word next to their caliber. They don’t have the bonus of +1AP/100m like the kinetic weapons. Their range is also shorter. 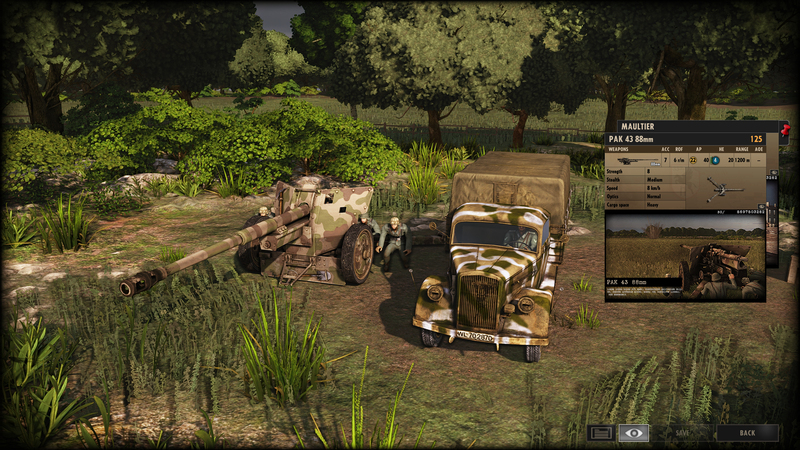 Tank destroyers that are meant to search and kill other tanks. They are loaded with few and even sometimes no high explosive (HE) shells at all. If your AP value = enemy Armor, you will only have a very small percentage to kill, and you will inflict only a small amount of stress. Shells will mostly bounce on the vehicle. If your AP value > enemy Armor, your penetration percentage will increase and you will inflict more stress to the enemy. After your AT fired, many things can happen. Case n°1: You missed your target. Woops. Try again if you have time. Each successive shot at the same target gives a precision bonus. Fall back before it counterattacks. 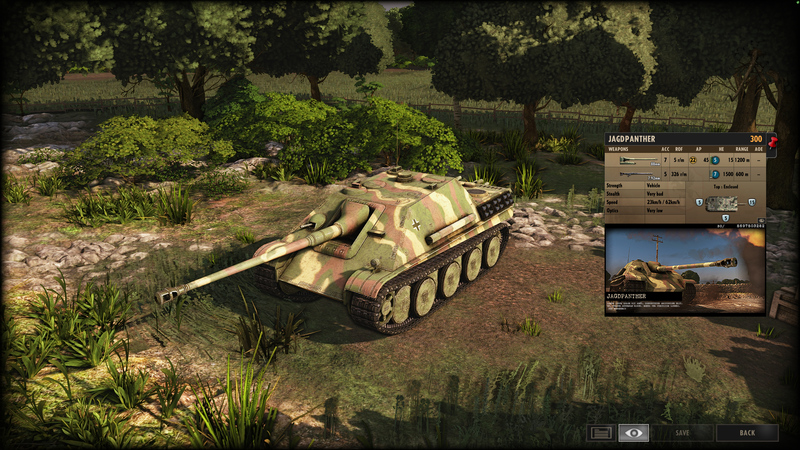 Case n°2: You hit the enemy tank but your shell bounced on its armor. Damn it! The enemy only suffers suppression damages, making him less effective to counterattack. A temporary and minor critical hit makes the tank less effective and more exposed to your final assault for a few seconds. The crew is knocked out, the transmission is damaged etc. Case n°3: You hit the enemy and your shell penetrated the armor. Hurray! Best case scenario: the tank is destroyed and its crew gets killed. The tank is rendered unusable and the crew bails out. HOW TO PLAY THE ARMORED WARFARE? We’ll try to give you some advice to maximize the chances of killing your enemy with your AT unit. In this situation, the AB M3 Gun 37mm is in a very good position: 72% chance of hit the tank, and he’s sure to penetrate (100%)! If the percentages are too low, just wait for a better target! Then, you have to decide when to shoot and hold your gun’s fire. Sometimes you’d better wait until you feel that it’s the perfect situation rather than letting your AT crew shoot automatically when he sees a target, even with 0% chance to kill. Indeed, you must have a good AP value to hit and deal damages! To do so, use the order “Return fire” at the bottom right of your screen in-game, or just press the ‘Z’ key (‘W’ for AZERTY keyboards). The unit won’t fire unless fired at, and it will avoid an unlucky shot while keeping aiming for it. When the opportunity arises, order your unit to shoot instantly by deactivating the order. This method is particularly efficient when you have many AT guns within reach. One for all and all for one! You have a better chance of destroying a tank by engaging not just a lone AT unit but several squads. This simple strategy has many advantages: one of the guns will continue to shoot without being stressed by the tank, it will keep its precision while the tank will be inevitably exposed. 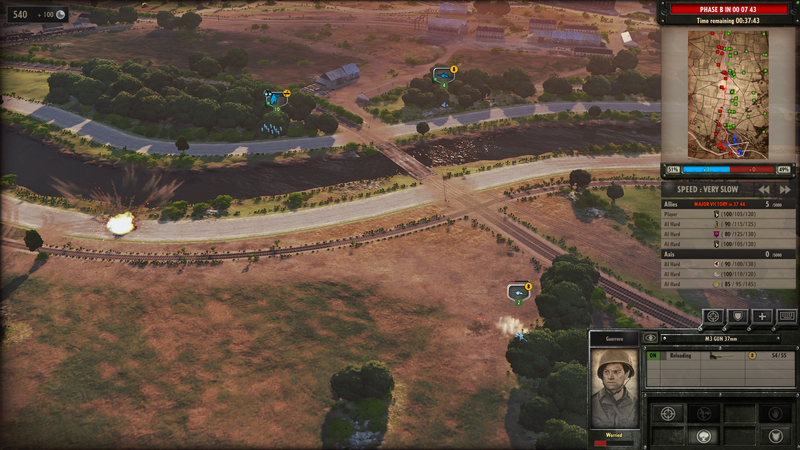 Always try to aim at the flanks or the rear, and avoid the frontal armor because most of the tanks are stronger there. You can either wait until it makes a mistake, distract the tank with another unit or spread your AT units to have crossed fires. Be aware that some elite tanks have good armor on their flanks and are harder to kill or stress! While the tank was focused on aiming at the AT gun on the other side, our selected M3 Gun 37mm used the opportunity to shoot at its weak side. An AT unit is never invisible. Even if you hide it in the bocage or in a house, you can be discovered. An enemy recon unit can inform any tank of your position and then, you will be in danger and pinned down before being able to shoot at it! 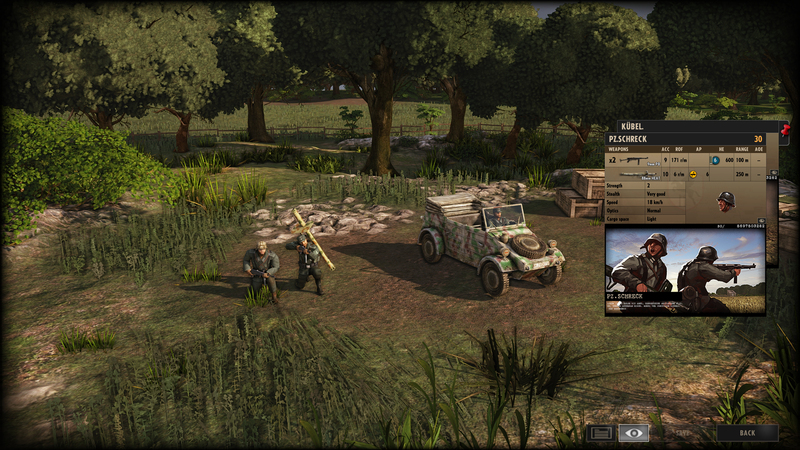 You can reembark any troops with any vehicle at your disposal. It’s the fastest way to move your AT gun everywhere. 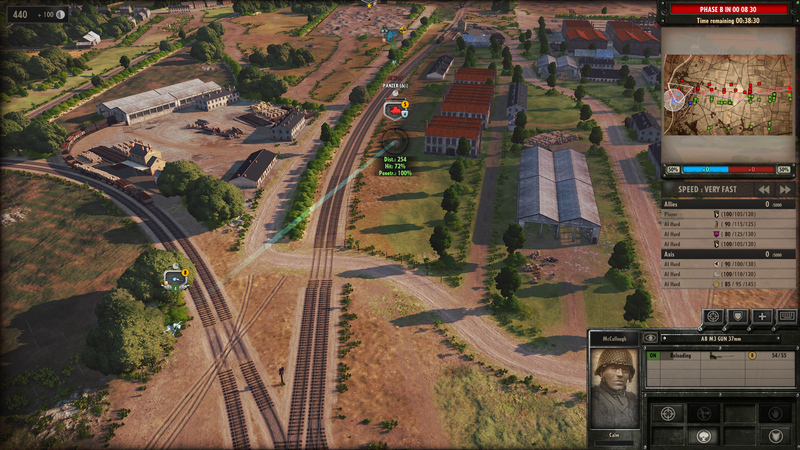 After many Beta requests, we also added the possibility to use a supply unit to move it across the map. To do so, just select one of your supply truck, and click on the AT gun. 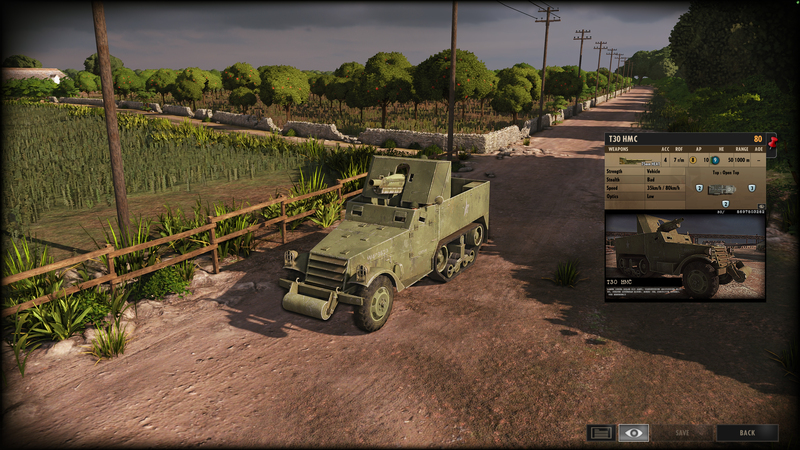 BUT I’M PLAYING WITH AN ARMORED DIVISION! HOW TO DEAL WITH AT UNITS? If you play an armored division, you must, of course, protect your tanks, the heart of your division. You have to be able to thwart ambushes and pay attention to the sky and heavy bombers. If you want to deploy one of your most powerful tanks, think about your approach and always protect it. Indeed, tanks have a poor line of sight, and must be accompanied and protected by other units (recon, infantry…) or else they are easy preys. Check the surrounding bocages. Stay away from dangerous areas. Don’t hesitate to use the reverse movement (default ‘G’ key) if your tank’s weak side is exposed, and use cover properly.